A membership in The National Air and Space Society is a wonderful gift for enthusiasts of aviation and space history. Pay tribute to friends and family members on this permanent memorial at the Museum's Steven F. Udvar-Hazy Center. Make a Wall of Honor donation today. Add a name to the Wall of Honor. Give a souvenir license plate as a gift! A portion of the proceeds supports the Museum. Order souvenir plates from the Virginia Department of Motor Vehicles (DMV). 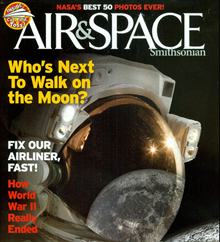 National Air and Space Museum staff writes a wide variety of aviation and space publications, including books on exhibitions; the collection; the history of science and technology; and planetary science. Book signings are often held for publications by Museums staff as well as other authors. A selection of products featured in the Museum Stores can be purchased online at SmithsonianStore.com. Look in the Air and Space shop for gifts like portable planetariums, models, aviation- and space-themed ties and shirts, books, stuffed animals, and of course, freeze-dried astronaut ice cream.